Go Orange Thunder Jet Boat + Queenstown Rafting, Go Orange, Queenstown, New Zealand. Here is your chance to pair two of Queenstown’s most iconic experiences. Packing in those famous 360 spins and dramatic canyon walls as you discover the Kawarau River and its pristine wilderness. The Thunder Jet will race down the river to your next mode of transport. Jump straight into a raft with the team at Queenstown Rafting to complete the last section of river, where the Jet Boats fear to go. Spend your afternoon paddling through the historic Kawarau gorge, famous for its gold mining, wineries and it’s stint in The Lord of the Rings franchise. Paddle and swim your way through grade 2-3 whitewater rapids with a brand-new cliff jumping section added for the adventure junkies. Complete your journey by tackling the famous 400m Dog Leg rapid – the longest commercially rafted rapid in New Zealand. Then head back to Rafting Base for a hot shower. Go Orange gives you an 25 minute experience you'll never forget. 360 degree spins with speeds up to 90kmph. Go Orange will be taking on the Kawarau river twice daily, now with the option to upgrade and arrive by Jet Boat. 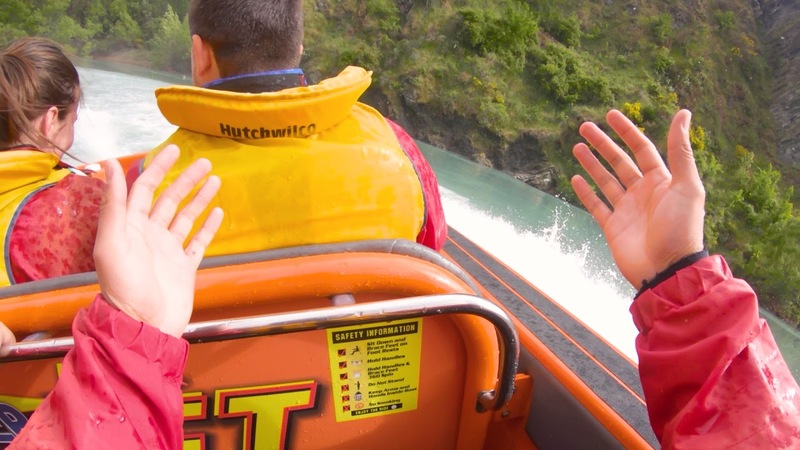 The Thunder Jet will race over Lake Wakatipu and down the Kawarau River to meet your guides, continue the experience rafting grade 2-3 whitewater rapids. Summer is here, the days are longer, the water is warmer and we are excited to be pairing two of Queenstown’s best loved experiences. Our prices have also changed, giving you the chance to save a few dollars, should you need to squeeze in another activity during your Queenstown holiday. Our trips are all half day trips, meaning we will have you back in Queenstown centre before you know it, exploring more of our playground. Make your way down to the Go Orange Shotover Street store where you will meet the team. Check in 15 minutes before your Jet 2 raft experience. Jump on our shuttle that will take you to the Rafting Base at Arthurs Point. Meet the guides, grab your wetsuit and head to the changing rooms. Get kitted out with your spray jacket and life vest before jumping on the bus. The bus will transport you to the Thunder Jet Kiosk in Queenstown Bay. Our drivers will take you further down the Kawarau River exploring the sheer cliffs and canyons. Continue your journey down the Kawarau River with your team. Raft, swim and tackle the grade 2-3 whitewater rapids. Cliff jumping is an added bonus on this trip. Take on the mighty 400m long Dog Leg Rapid (NZ’s longest commercially rafted rapid). Jump back on our bus, as we head back to the Raft Base. Enjoy a hot shower and a cold beer down at Canyon Food & Brew Co.
Jump back on the shuttle to downtown Queenstown. Can I participate in this experience? We have a minimum age of 13 years for our experiences that include rafting. You have to be between 40kg - 120kg. Please check the Terms & Conditions. Do I Jet Boat in my wetsuit? Yes, you do. We will take you to the Jet Boats from the Rafting Base. If you are not Jet Boating, you will stay in the bus and carry on via road to the Kawarau River put in. Where do I put my wetsuit on? You will get all your gear at the Raft Base before your trip begins. When you check in at the Shotover Street store a shuttle will take you out to the Raft Base at Arthurs Point, here we have changing rooms and hot showers for when you return. How long is the Jet Boat ride? Your Jet Boat experience will be around 30-40 minutes long. You will be joining the Thunder Jet one-hour trip, once you have unloaded, they will turn around and head back to Queenstown. How do I get back to the Rafting Base after the experience? Your experience will finish at Rafters Road where our bus will be waiting. We will load the rafts on to the trailer and head back to base together. Are my experiences getting cut short because I'm combining two? 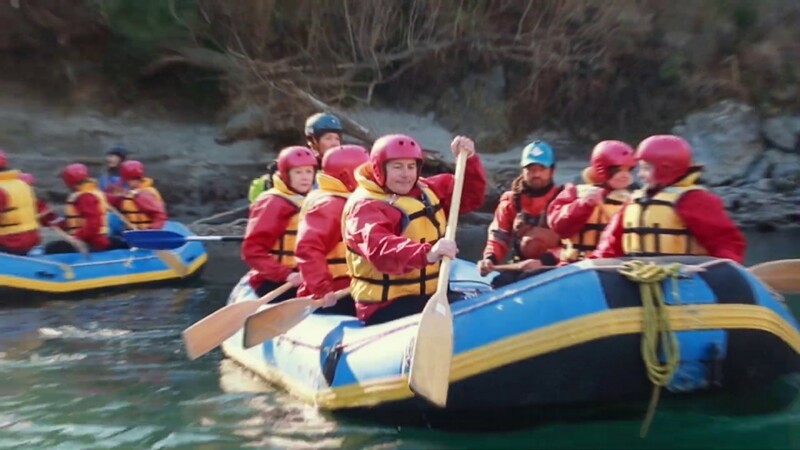 No, the Kawarau River Rafting experience is the same time as you meet the crew at the start point. Thunder Jet offer a 25-minute trip down the Kawarau River, that is what you are booking. Double the adventure. You don’t. Please ensure you have eaten before your experience, you will be on the water paddling for at least two hours. You can however purchase food and drink from Canyon Food & Brew Co located out at the Raft Base. Do we take the rafts and the paddles with us on the Jet Boat? No, we wouldn’t want you to lose these during those famous 360-degree spins. All the equipment apart from the gear you are wearing will be taken to the raft put in on the bus. Will there be other people on the Jet Boat? Potentially yes. You will be joining the Thunder Jet one-hour trip so there will be Thunder Jet customers on the boat. You will sit together with the other rafters and a guide. Will we see Dolphins on the Jet Boat? Unless we find a rare breed of fresh water Dolphins during you experience then no you won’t see Dolphins.